Rain is in the forecast for much of central and northern Maine this coming week, but won't be enough to have a lasting impact on current dry conditions. Amanda Mathieu has spent the past week or so lugging 30-gallon buckets of water to her strawberry field in an attempt to save some of this year’s crop. 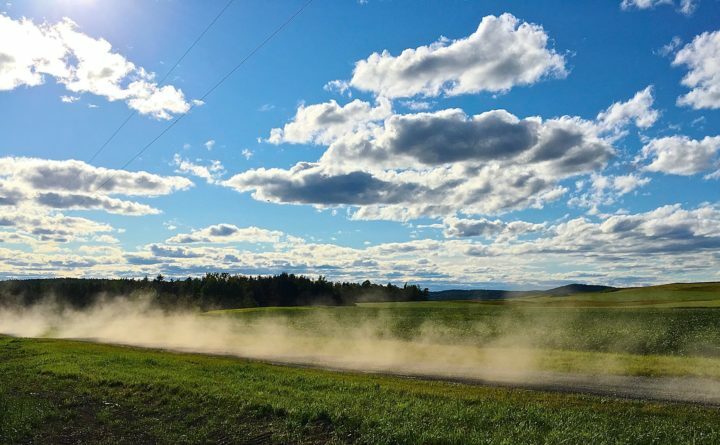 The northern tier of Aroostook County is currently experiencing abnormally dry conditions, according to the U.S. Department of Agriculture’s online drought monitor, a term used to describe areas showing dryness but not yet in drought. So far in July, Aroostook County has seen just under an inch and a half of rain, according to Tim Duda, meteorologist with the National Weather Service office in Caribou. “Compared to the normal average, we should have had 3.08 inches of rain so far this month,” Duda said. Temperatures are also above normal for July, Duda said, averaging 69.7 degrees, 4.2 degrees above average. Caribou set a record high in July 5 when it hit 94 degrees, he said. For growers like Mathieu, the combination of little rain and high temperatures is taking a toll on crops. What berries she was able to pick were small and many ripened unevenly due to the heat. It’s the same story at McElwain’s Strawberry Farm outside of Caribou where the dry conditions were the second of a one-two weather punch. Heavier and wetter snow than usual this past winter damaged his strawberry plants, he said. The dry spell caused further damage to the already weakened plants. McElwain does irrigate some of his fields by pumping in water for the berries, but that has not been enough this summer. McElwain estimates his harvest this season is 25 percent less than last year’s. Aroostook County’s hay crop, she said, has been hit especially hard this summer. Trickey said she’s seen dry seasons before, but this one seems to be hitting harder that usual. Conditions could also impact northern Maine’s 2018 potato crop if they do not improve. Over the next month the potatoes start to put on their size, and they need water to do it. Areas of particular concern this year are fields that contain a lot of gravel in the soil. Dwyer said there is, however, every reason to be optimistic for this year’s crop. Rain is forecast for later in the week in Aroostook, and Mathieu is hoping it will be a steady, soaking rain. For now, Mathieu is pinning her hopes on a late season strawberry plant that should be ready in August. “I’ll just keep hauling the water if it doesn’t rain,” she said. Others, like McElwee, are done with the season. “Our attitude is there is always next year,” he said. In the meantime, Bott encourages farmers and gardeners to practice water conservation. Those prayers may already be answered, according to Duda, who said the area is forecast to receive a steady soaking rain starting Wednesday night and lasting into Thursday.